Sinn Féin TD for Wicklow and East Carlow John Brady has called on the Government to address the crisis in respite care for children and to restore hours that have been slashed, as shown by figures released to Sinn Féin in a response to a Parliamentary Question from the Health Service Executive (HSE). “I know that the Tánaiste is keenly aware that there is not a Deputy in the Dáil who does not receive emails and calls on a daily basis from desperate parents and family members who are seeking respite care hours for their children. “For that reason, I was shocked and angered at the figures released by the HSE which showed that while the number in need of respite is going up the actual allocation of respite care hours is decreasing. 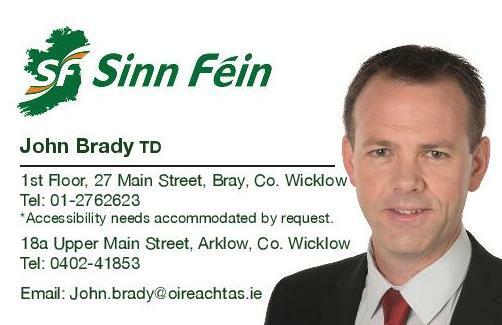 “In relation to Wicklow, the figures released to Sinn Féin show that in the first quarter of 2016 there were 2,628 overnight hours of respite care provided, however, in the first quarter 2017 this figure had dropped to 1,879. “When it comes to day only respite care for Wicklow, figures show that in the first quarter of 2016 there were 195 hours of respite care provided, however, in the first quarter 2017 this figure had dropped to 141. “This is completely shocking and unacceptable. These hours provide respite to parents and families who have a child in the household with a disability; they are some of the hardest pressed and struggling families in the state, and the evidence shows that this Government is failing them.